The needs of the growing world population, together with the need to reduce the impact of climate change, require new energy science and technologies to be developed. 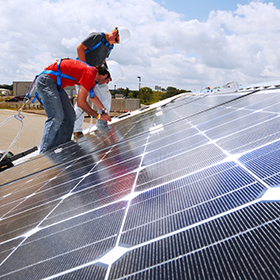 The programs in energy systems address renewable and clean energy technologies including wind, solar and biofuels; new battery technology for storage of energy; efficiency in the production and utilization of energy; and advanced processes and materials that reduce resource demand and environmental impact. Alternative energy systems focus on energy production from nontraditional sources like biomass, wind, and solar. 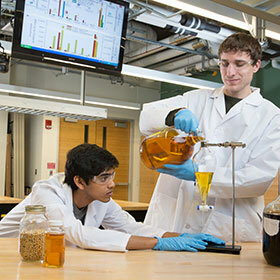 We are investigating new processing techniques to produce energy from biomass as well as developing bio-based products that replace petroleum-based products. 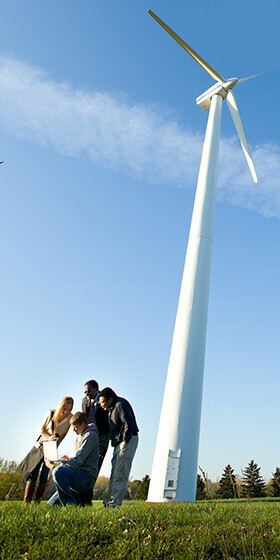 Research in wind and solar energy focus on improved energy production and storage for these intermittent energy sources. Energy production, transmission, distribution, and storage focus on cost-effective and reliable delivery of electrical energy, including from distributed energy sources like wind and solar generation, while maintaining grid stability. We are optimizing electrical grid operations from small scale (microgrids) to large scale (nation-wide). Alternatively, energy harvesting can supply power directly to small devices. The efficient utilization of energy is the most direct way to reduce resource consumption and environmental impact. Because buildings consume over 40% of all energy produced, better building performance is key to improved energy utilization. Faculty are addressing this area by investigating building envelope design and construction, improved insulation materials, and smart windows and doors. We are also exploring efficiency improvements to many energy producing and energy consuming devices and products.